It was on this day back in 1982, when Conch Republic established itself after border patrols were set up on the mainland of Florida, isolating Keys residents. The residents of the Florida Keys revolted, established their own country with a flag, form of government and then immediately applied for foreign aid. This independent spirit continues today and we celebrate it with nine days of events. This evening an old favorite is coming back, the seven foot Key Lime Pie. The fun begins at Mallory Square at 5:30 and is a benefit for the Key West Memorial Sculpture Garden which honors many of the republic’s famous and not so famous citizens. This past weekend Old Town Trolley Tours of Key West was a sponsor of the Southernmost Air Spectacular held at the NAS Boca Chica. The headline group was none other than the Naval Flight Demonstration Team, more commonly know as the Blue Angels. 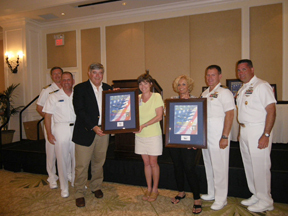 Our own Chris Belland and Linda Test were at the opening event where they were presented with a sponsorship plaque for Navy officials. They also go to mix and mingle with various flying groups both civilian an and military. Be sure to check out two great new pages on our website at www.trolleytours.com/key-west. We have just added an Events page so when planning your next vacation to Key West you can see what fun festivals, street fairs, fishing tournaments and literary seminars are taking place at the same time. Be sure to check out our comprehensive listing of Attractions as well. People are often amazed at how many museums, attractions and water sports we have on our small island. You are currently browsing the Old Town Trolley Tours Blog blog archives for April, 2010.